Ever since we bought our second-hand spinnaker in Annapolis, it’s been quietly sitting in the forward locker waiting for its’ moment of glory. 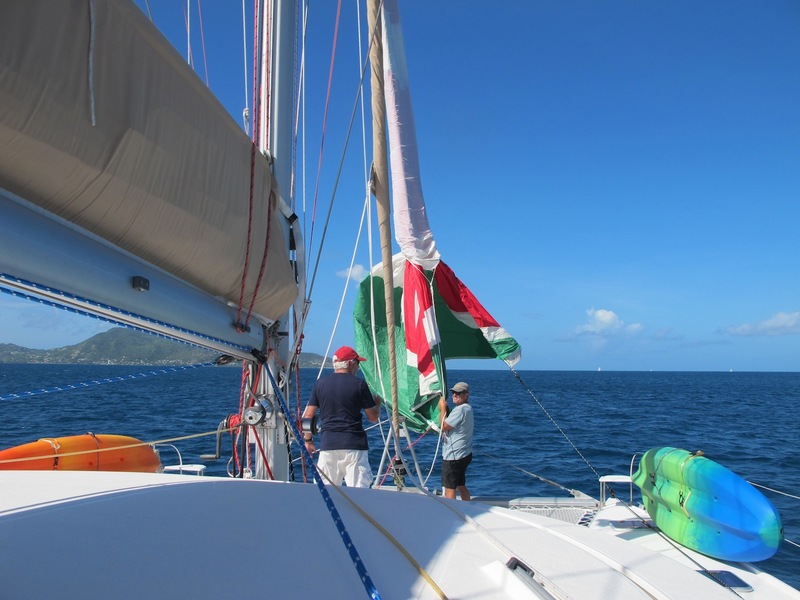 In the Caribbean, the wind is either too strong, or from the wrong direction for kite-flying and in fact we’ve only seen one other yacht flying a spinnaker in the whole time we’ve been here. A rare species indeed. 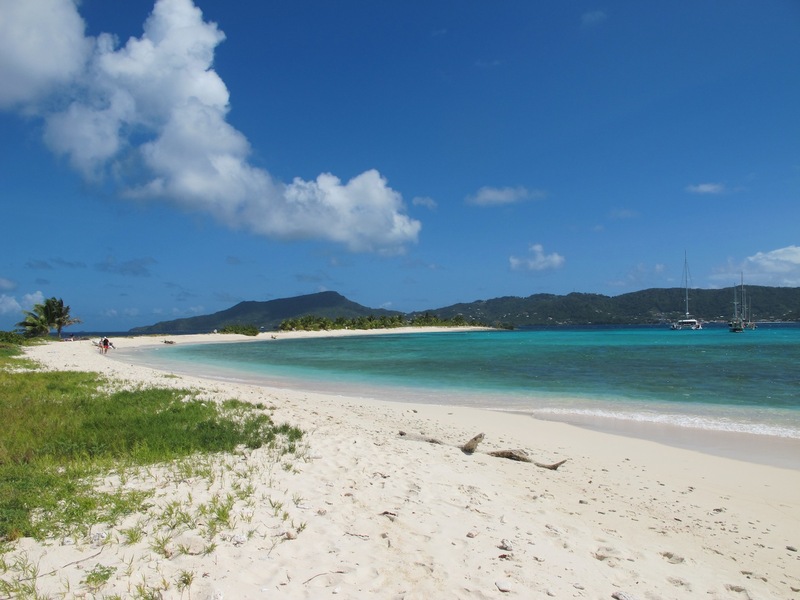 So it was with some excitement that we thought that possibly, just possibly, we might get to play with the kite on the way to Carriacou. 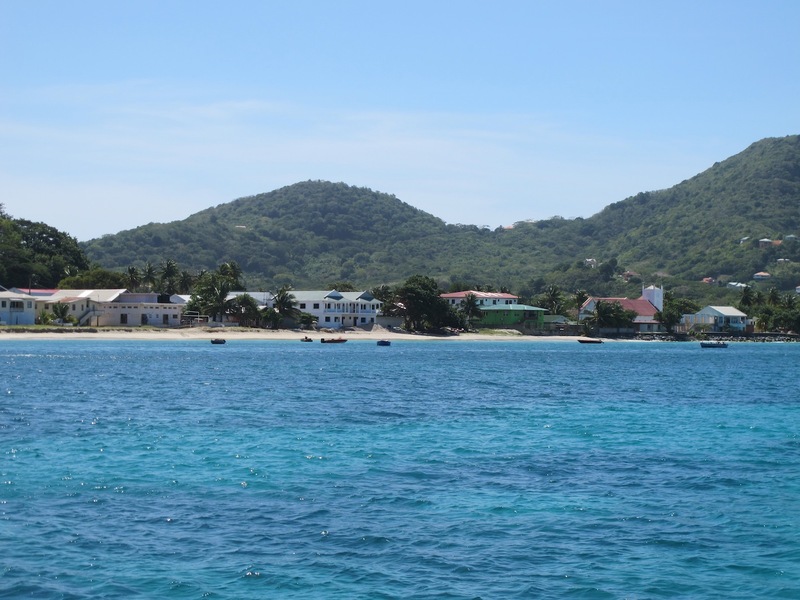 But before heading to Carriacou, we had some other exploring to do. Motoring out of Clifton Harbour, Union Island we headed across to Petit St Vincent (PSV), a private island with an exclusive resort where guests get pampered in their own secluded cottages. Apparently you raise the flagpole on your cottage when you want room service, and the butler appears in the mini-moke. What else would you expect for US$11,000 per night?? 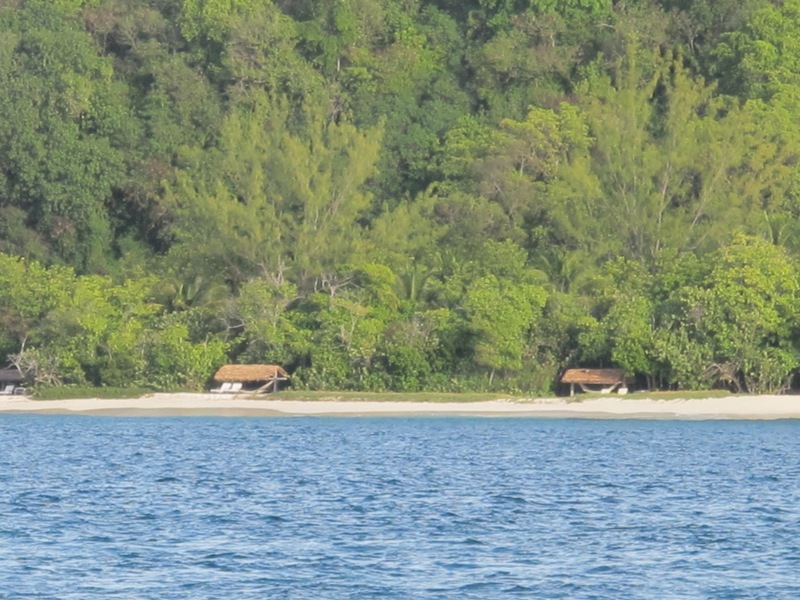 Us grotty yachties are allowed to anchor off the island but are restricted to a small strip of land where the beach bar is (entrepreneurs never miss an opportunity to make a buck). Despite the opportunity for some celebrity-spotting, we decided to thumb our noses at the rich and famous and stayed aboard enjoying our own delicious food and wine. The next day we took the boat over to Morpion, a small sand cay off the island, distinctive for it’s little thatched hut on the sand. Bruce wasn’t able to get in the water due to his injuries, so Ron kept him company on the boat while the rest of us went for a snorkel over the reef. Again, not very exciting underwater scenery but the turquoise water was warm, beautiful and clear. We enjoyed a couple of hours there before heading off after lunch to Petite Martinique, where we’d heard we could procur reasonably priced cartons of beer (an essential provisioning item on board Toucan!). 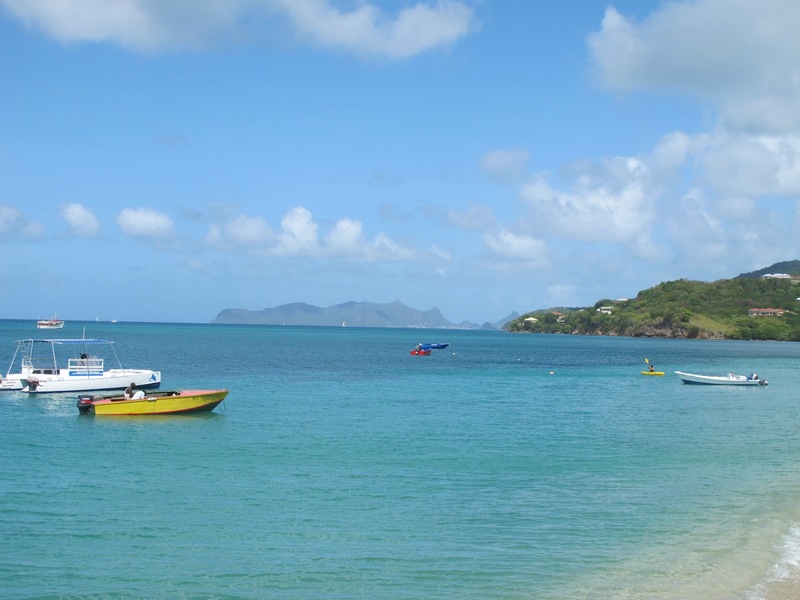 Petite Martinique is right next door to Petit St Vincent, but the two islands couldn’t be more different. 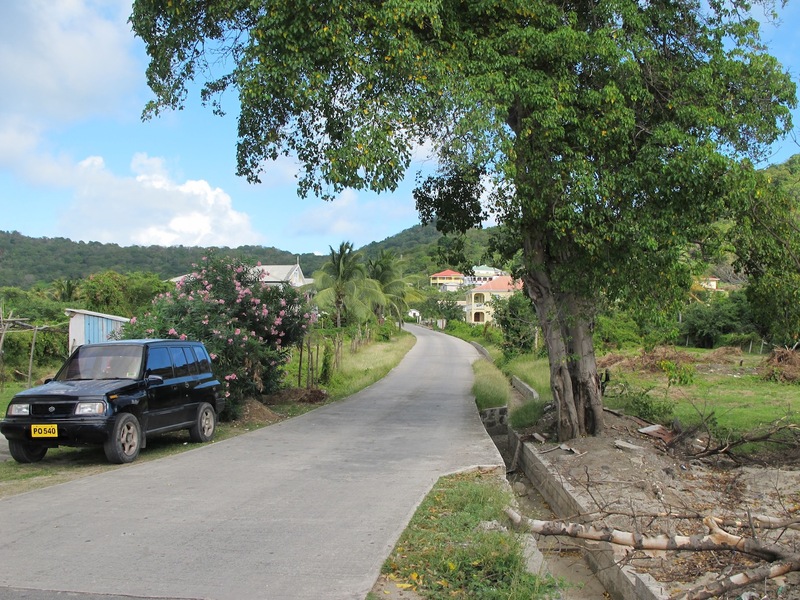 In contrast to the exclusiveness of PSV, Petite Martinique is your no frills, local working community, subsisting mainly on fishing. We anchored in amongst the fishing boats so that the ‘beer provisioning party’ of Rob, Geoff and Jackie could get ashore. But once their mission was accomplished we decided to motor the very short distance back to the more attractive anchorage at PSV. 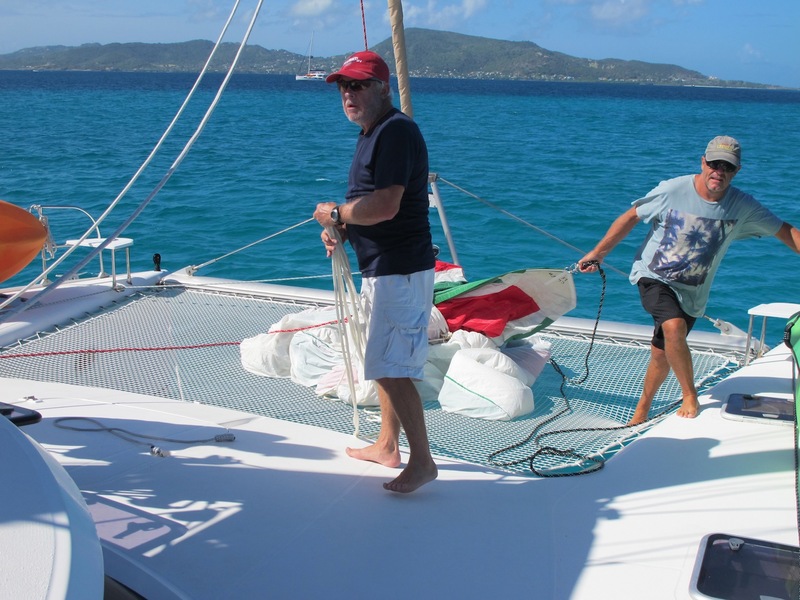 The next morning we headed west-south-west towards Carriacou, only 8 NM away, but the conditions were perfect for a spot of kite-flying. Let’s do it! The boys were in their element discussing the best way to rig the sheets and lines, getting ready for the hoist. 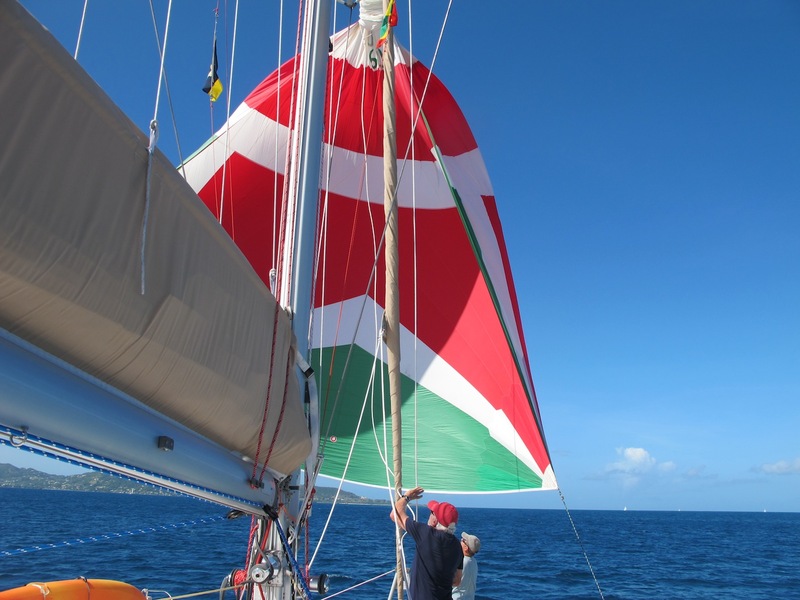 And then there it was in all it’s glory, with such bold Italian colours that it was instantly dubbed Luigi (for those of you who followed our previous blog you’ll remember that our spinnaker on Illusion was named Nelson because it was made in South Africa). What a sight! It seems to be the perfect size for the boat and sets very well, so we took lots of photos to send back to Gary at Bacon Sails who sold it to us. Thank you Gary! 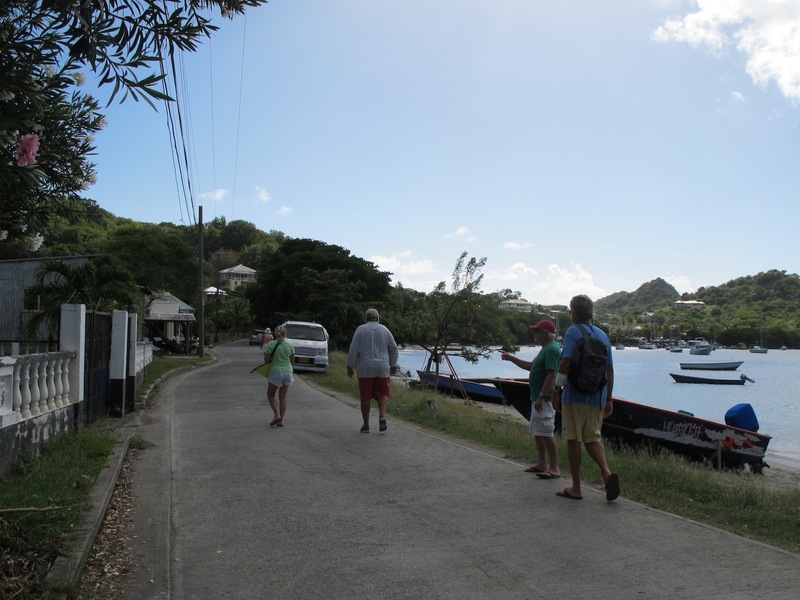 Carriacou is part of Grenada, the last country in the Windward chain of islands, so we needed to check in when we arrived in Hillsborough, the capital. Bruce and I dinghied in with all the papers and passports. Immigration was the first stop, in the Police headquarters building. When we arrived about midday there was already a queue of other yachties waiting to check in. It was obviously going to be a long process so we decided to go and have some lunch and come back later. We found the New Wave restaurant overlooking the bay, where the beer was very cheap and the menu very limited. We ordered chicken rotis which were different, to say the least. They were very large, but stuffed mostly with cubes of potato and the occasional bit of chicken thigh or wing still on the bone! We wandered back to immigration where the queue had grown even larger as the immigration officer was still at lunch. The Frenchwoman in front of us was becoming quite agitated about it all, but the rest of us accepted this was just ‘island time’ and resigned ourselves to whiling the time away by exchanging cruising information. When the immigration officer did finally return, she was resplendent in white starched shirt with epaulletes, tight black skirt with black stockings and patent leather shoes, peaked cap and a baton tucked under her arm. Quite a sight! She was good- natured and friendly, but obviously a bit overwhelmed by the number of yachts needing to check in and out. Finally all the laborious paperwork was complete, and then we had two more stops at customs and the port authority to pay our fees before we were legally stamped into the country. What a process! 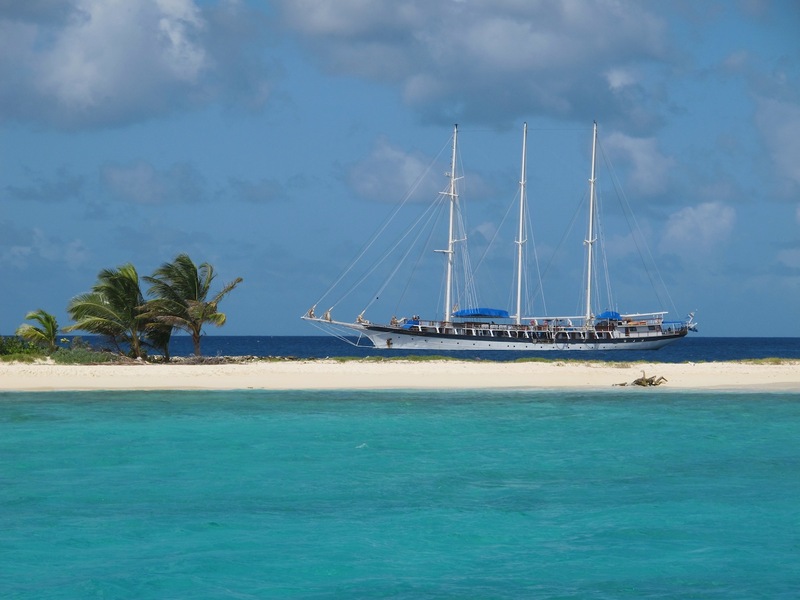 The anchorage at Hillsborough didn’t hold much attraction so as soon as we got back to the boat we moved a little further south to Sandy Island, another beautiful sand cay surrounded by reef. 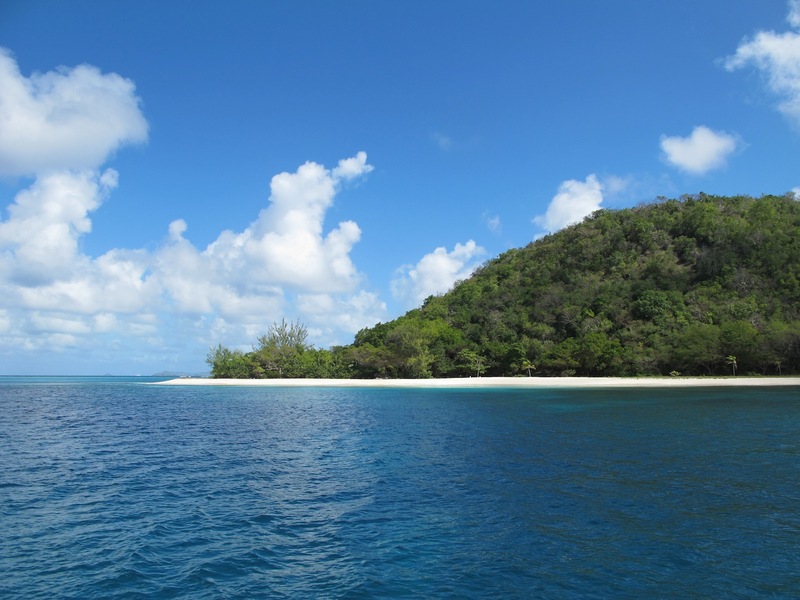 We spent a lovely day exploring the beach, snorkeling on the reef which had an abundance of fish life, and generally relaxing before moving round the corner to Tyrell Bay which was supposedly a very popular anchorage with cruisers. 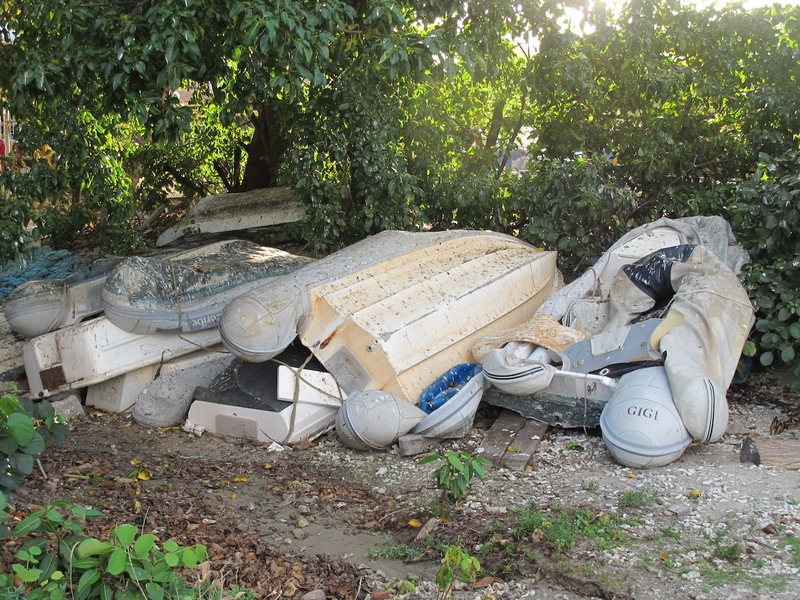 There were, indeed, a lot of yachts anchored in the bay, but I can only think the only reason for its’ popularity is that it has a boatyard where you can do your own work on your boat, because otherwise the place was rather underwhelming. 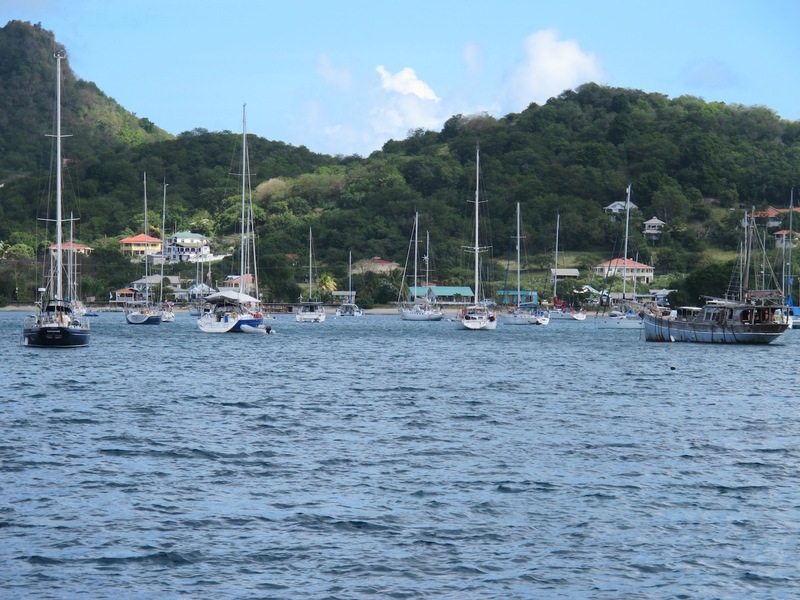 We had a walk ashore and a drink at the Lazy Turtle restaurant and bar, checked out the boatyard and determined that that was about the extent of the sights to see at Tyrell Bay. 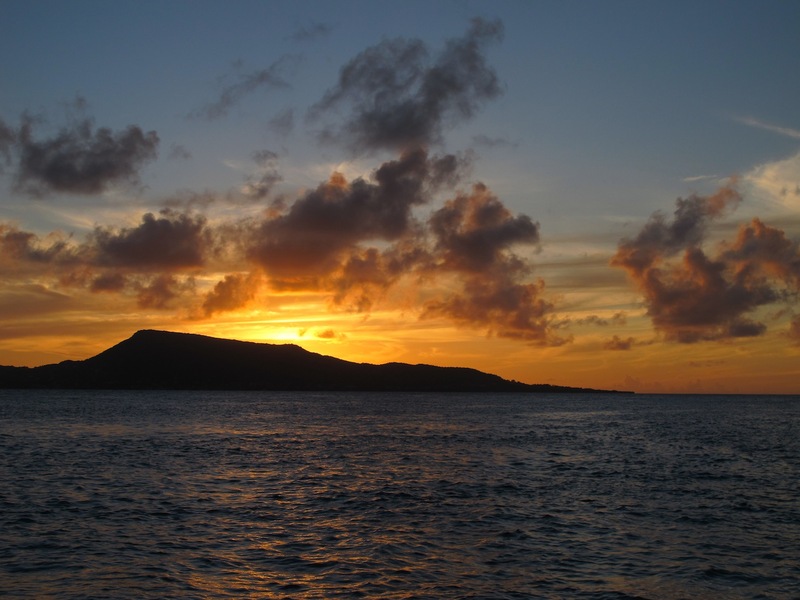 Tomorrow we head for Grenada, the southernmost part of our trip and our last stop before heading west to the ABC islands.